Systergy, n. A collection of women, who by daring and dreaming together, will make synergistic contributions to their own lives and the world. Dana King sent along an article from St. Louis At Home on The Spirit of St. Louis Women's Fund, a superb example of systergy. 1) Give money -- Each member promises to give $1,200 a year for five years; 90 percent goes to the charities; 10% to overhead. With over 100 women in the Fund, that's over $100k/year for five years (at least) that will be invested in the community. 2) Vote on where the money goes -- Last year over 300 proposals were presented. A committee reviewed the proposals, visited applicants and put together a final ballot of candidates. Among the nine organizations funded were Gateway to Hope, an outreach for women with breast cancer who can't afford medical treatment, and La Clinica, a prenatal healthy baby program. Ms. Schagrin concludes her interview with the words, "Together we can do more than we can do apart." Systergy in word and in deed. Atta Girls Shelby Schagrin and Susan Block! Are there any "investment" clubs like this in your community? If not, have you thought about starting one? Possibly in Boston? 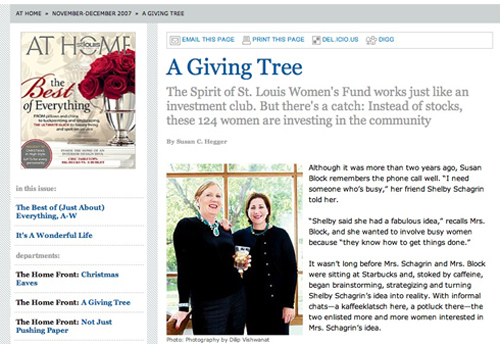 The Spirit of St. Louis Women's Fund is an example of institutionalized systergy. Any other institutions that you can think of where systergy is formalized? What about on an informal, ad hoc basis? Systergy, n. A group of women, who by daring and dreaming together, make synergistic contributions to themselves and the world. When 17 year-old Emily Trujillo wanted to learn more about interior design, she asked St. Louis designer Dana King for help. Determined to provide Emily with a hands-on experience, Dana approached the local Habitat for Humanity about decorating a newly-built home. As Dana partnered with additional interior designers, and Emily recruited her friends, the design team, including the Berry family, swelled to thirty. The goal? Make the Berry house a home. 1) Even though it must have taken courage for Emily to ask for help, knowing Dana as I do, Emily undoubtedly knew it was safe to ask: Dana would be a competent and caring mentor. 2) Many would have discounted Emily's ambitions because she's 17. Dana King didn't. 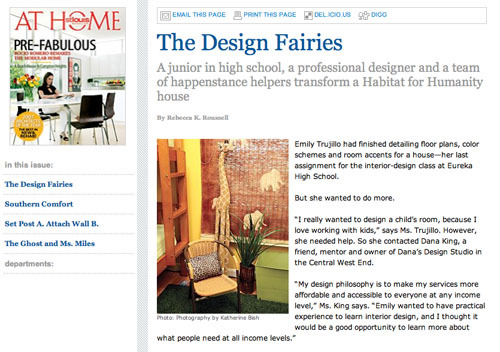 Instead she created a forum where Emily could learn many aspects of interior-design, including acommodating her client and how to collaborate with fellow designers. In other words, Dana was able to see the magnificence in Emily, and was willing to create a situation in which Emily could become her own see-er. 3) In the thick of mentoring Emily, Dana made new friends in the community, broadened her skills as both an interior designer and project manager. Dana also discovered a philanthropic organization (Habitat for Humanity) with whom she would like to partner going forward. Contrary to generally-held opinion, in a sustainable mentor-mentee relationship, there is a give and get for both parties. Because we only really dream when we are together. In whose capable hands will you feel safe? How can you create a win-win for all involved? Last week at Fusion, the salon-style discussion group to which I belong, one of the women shared with me how much she was enjoying my blog, and asked if I would like to meet for lunch to brainstorm with her around her ideas? I didn’t jump up and down in front of her, but I wanted to. I blog because I want to find my voice AND because I have something to say, but it requires an opening up, a vulnerability, a gift of self that I can’t guarantee will be received; something I’m reminded of each time I press the Publish Now button. For someone to receive my gift, and to also thank me for it, is a gift in its own right. Because I’d like there to be even more giving and receiving, daring and dreaming, it's time for a dare to dream contest! During the month of May, invite people to sign up for the dare to dream e-mail updates (Click on Subscribe in the upper right hand corner). So that I can keep track of who signed up whom, just send me an e-mail to let me know when one of your friends or colleagues has signed up (e-mail updates rather than RSS feed). Whoever signs up the most people will be the winner; I’ll make an announcement on June 1. During the month of June, I will spend 1 1/2 - 2 hours with the winner, either in person (if you are in Boston or want to come to Boston) or by phone, brainstorming with you around your dream. We can spend our time discovering your dream. Or we can focus on how to make your dream happen, or both, if time permits. As you examine the mechanics of the contest, you’ll note that it’s intended to be a prototype for the dare to dream Intellectual Immigration Fund. When you invite women to subscribe to e-mail updates, you extend an invitation to dream, and you are offering support to me, thus making deposits into the Fund. In turn, as your friends and colleagues thank you for encouraging them to pursue their dreams, and I work with you to discover or do your dream, you make Fund withdrawals. Naturally, the Fund is powered by systergy. Finally, if you have any questions about the contest, why not post in the comment section, and then I'll answer for everyone. In the meantime, let the systergy begin! What deposits have you recently made into the Intellectual Immigration Fund? Who have you encouraged and supported? For whom have you been a hero of support? What withdrawals have you made from the Fund? Who encouraged you? Taught you how to do something you wanted to learn? Katrina van Overbeke just shared with me the website www.change.org, a social network for hundreds of social causes and over 1 million nonprofit organizations. When I went to the site and clicked on the tag Empower Women, it took me to an article, which quoted Muhammad Yunus, the recent winner of the Nobel Peace Prize, as saying, "The more women are empowered, the more fundamentalism is weakened." Having been on the advisory board of a micro-finance institution in Latin America, I am a strong proponent of micro-finance. As women have the opportunity to bootstrap their way out of poverty, they not only become active members in their community, their children are able to stay in school, thus making potentially even greater contributions to society. To consider the possibility that micro-finance can also be a catalyst for widespread social change is simply breathtaking. But what does this have to do with you and me and 'dare to dream'? The Intellectual Immigration Fund is, after all, patterned after the micro-finance model, only the deposits and withdrawals are in the form of intellectual capital and encouragement, rather than monies. And whereas no one will argue with me that in places like the U.S., Canada, and Europe, monies are in relatively ready supply, given the apparent rampant depression in the U.S. (whose root is often repressed anger), I would argue that the ability to trust ourselves, to encourage one another, to move to the center of our lives, is not. If each one of us began to actively make deposits in the Intellectual Immigration Fund, mentoring one another, being the see-er of one another's magnificence until we can see it for ourselves, how many more of us would move to the center of our lives? And, when we are at the center of our lives -- as an individual, a spouse, a parent, a daughter, a friend -- we are changing the world. Several years into my investment banking career at Smith Barney, my boss hired Ana Gomez, a young woman born and reared in Colombia, who had just graduated from Cornell with a civil engineering degree. Adorable, effervescent and so very smart, my superiors began giving some of the more substantive work to her, bypassing me. I was devastated, and supremely jealous. (Yes, indeed – I wanted to trip the prom queen – desperately). Needless to say, I didn’t mentor her. I just couldn’t. I didn’t have it to give. I experienced bounty at a Christmas party in early December. So that they could fete their friends with desserts, the Robisons spent an entire day visiting some of Boston’s best bakeries and pastisseries. Truth be told, when I go to parties I often go light on dinner just so I can have more dessert. But that evening there was SO much dessert, I found myself waiting longer than usual to eat, and eating less. I kept thinking – when I’m ready, there will be enough. My childhood friend Liz Economy seems to experience bounty in her life generally, and in her professional life especially. An expert on China, Liz works at the Council on Foreign Relations, a non-partisan think tank. Last summer when she needed to hire a research assistant, instead of simply bringing her top pick on board and getting on with her busy life, Liz picked up the phone and made calls on behalf of several of the top candidates she didn’t hire to help them find great jobs elsewhere (for example, at The New York Times). Because Liz felt bountiful – she already had enough acclaim, and in this instance, enough political capital, to feel she had a storehouse from which she could give, and therefore she did. These days, my sense of bounty usually extends beyond dessert parties, particularly in the professional sphere. Because of this feeling of having more than enough, I find that I am willing and happy to share the professional limelight, to encourage others’ endeavors, and even expend my time and influence on their behalf. Of course, I have the “more-than-enough” feeling some days more than others. But when I do, and I can give, my cup runneth over. In what area of your life do you feel a sense of bounty, and can give from that bounty? As a community volunteer, mother, artist, professional, athlete? Who within your sphere of influence would be a grateful recipient of a portion of your bounty? Perhaps there is someone who you truly like but just haven’t reached out to yet – maybe because you were scared. Could you start a conversation about what you know how to do or offer a simple word of encouragement? This morning I read a story in The San-Jose Mercury News, my hometown newspaper, titled Woman Grows Oprah’s Gift 30-fold. In the article, reporter Truong Phuoc Khanh tells of 46-year-old Michelle Hall, one of 300+ Oprah audience members who were each gifted a $1,000 debit card, courtesy of Bank of America; their mandate was to give away $1,000 within a week. Michelle did indeed give the money away. But the total donated wasn't $1,000, it was $30,000. When she returned home to San Jose, she called her friends, who called their friends, who called their friends, who then approached Ikea, Orchard Supply Hardware, Beverly’s Fabric and Crafts, Mancini’s Sleepworld, and Westfield Valley Fair. This past weekend, having already raised $15,000, Ms. Hall attended a charitable fundraiser in San Francisco. When the host Don Bleu told the crowd of her initiative, the guests dug into their pockets and contributed $14,000. Total funds raised and, in turn, contributed to charitable causes during one week? I do not know Ms. Hall, nor have I spoken with her, but I think her story illustrates quite nicely the mechanics of the Intellectual Immigration Fund, as well as the importance of systergy. Intellectual Immigration Fund, n. Women borrow and repay loans of intellectual capital in the form of mentoring, allowing them to emigrate from one level of knowledge to another. Systergy, n. An organization of women, who by daring and dreaming together, will make synergistic contributions to their own lives and the world. Ms. Hall’s case is unique in that she had $1,000 of seed money -- and the Oprah brand that she could leverage. What isn’t, and doesn’t have to be unique, is that she was so committed to growing this $1,000 exponentially within a very specific timeframe, she was willing to draw upon the support and encouragement of others (a sisterhood – with kudos to Don Bleu), which helped her increase that original grant thirty-fold. Having now drawn on intellectual capital, and with systergy to power her efforts, Michelle is now in a position to contribute to the community in a far more meaningful way than she has in the past. She can also become a resource for other women who want to contribute to the community through fundraising, thus recycling the intellectual capital back into the Intellectual Immigration Fund. Michelle Hall – you’ve altered the face of my hometown. Over the past year as I considered how to implement Dare to Dream, creating a framework in which systergy could flourish, I was also involved on the Advisory Board of a microfinance institution in Latin America. I was able to experience and examine how micro-finance could help women build better lives for themselves and their families, changing their circumstances in ways only made possible through these small loans. As I brainstormed with one of my mentor friends on this topic, it occurred to me that the micro-finance model would be well-suited to our needs in connection with Dare to Dream. As a general rule, micro-credit works like this: impoverished women, usually in developing countries, who rely on traditional skills and entrepreneurial instincts, obtain loans of less than US$200 to buy cows or chickens, or a sewing machine, or a cell phone, whatever the need, to start, establish, sustain, or expand very small, self-supporting, often home-based businesses. A key to the micro-finance model is the recycling of loan dollars. As each loan is repaid—usually within six months to a year—the money is recycled as another loan. I began to test out my ideas around an Intellectual Immigration Fund earlier this year with a group of about 60 women. Before we met as a group, about half of these women wrote down something that they wanted to accomplish, and delivered these dreams to me. One wanted to learn photography; another wanted to become a wedding planner. By having this information in advance of our get-together, I was able to introduce each woman to someone who could help her achieve her dream. The one who wanted to learn photography was able to meet and spend time with a professional photographer. That professional photographer, who was engaged to be married, was later on the receiving end of systergy, as a woman who dreamed of becoming a wedding planner volunteered to help her with her wedding. Systergy is the catalyst for Dare to Dream…we take out small loans from another individual in the form of advice, expertise, encouragement (intellectual capital, rather than financial). We then recycle our intellectual capital back in, by coaching another woman in areas where we have expertise. As we borrow, we are mentored. As we repay, we mentor someone else. And it is through the connections we establish, and the subsequent mentoring, we are able to create something greater than we could alone create. When I shared the idea of systergy with one of my mentor friends, she described the image of an open-air market, a farmer’s market, where fresh fruits and vegetables and homemade goods are bought and sold. There is bounty, there is exchange, there is a personal touch that is nurturing. As I reflected on my friend’s thoughts, I looked up at my living room wall where my cherished pieces of artwork hang, works of art that I have collected largely during my travels to Latin America. To my astonishment and utter delight, more than a few of these tapestries, works of embroidery, and paintings include images of community, of women at market. Come to market. Dare to Dream.